EST. 7,500 B.C. TO 5,100 B.C. EST. 8,000 B.C. TO 6,000 B.C. 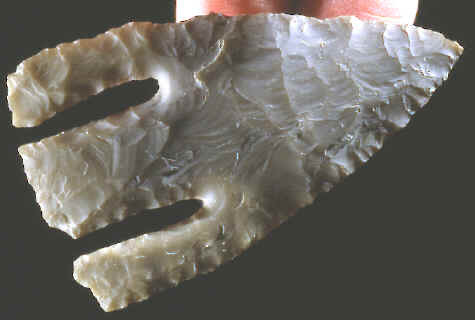 This Andice point was found several years ago on the Gault sit by David Olmstead in Williamson County, Texas. Complete examples like this one are rare. Their fragile barbs and basal stems usually did not survive intact. Resharpening and breakage from use left most of them damaged. This example was probably resharpened at least one or more times. It was made of Texas chert, possibly Georgetown and measures 2 3/4 inches (7 cm) long and 1 5/8 inches (4.1 cm) wide. The notches measure 15/16 of an inch (2.3 cm) deep. Andice points were named for examples excavated by J.E. Pearce from the Gault site in 1929 near the town of Jarrell, Texas. These points were named after the town of Andice which is located a few miles west of the Gault site. Andice points are found in the Early Archaic Jarrell Phase of Central Texas and may be related to Calf Creek points. An estimated age for this point would be somewhere between 7,500 B.C. and 5,100 B.C. The area of distribution is mainly in eastern Central Texas. The most distinguishing trait of Andice points are their long narrow rectangular stems and prominent barbs. These are knife forms used for cutting. They were repeatedly resharpened until the barbs were weakened and eventually broke off. A unique trait of both Andice and Bell points concerns the way they were hafted onto handles. Most knives, with or without notches, where hafted onto handles by covering some of the basal edges with some type of hafting materials. Andice, Bell and even Calf Creek points were hafted onto the center stem. This left the barbs uncovered so they could be used for cutting. But this feature is probably one of the reasons why so many of the barbs broke off and so few examples are found intact. 1985, "Selected Preforms, Points, and Knives of the North American Indians, Vol. I," Calf Creek, by Greg Perino, p.62. 1987, "Stone Age Spear and Arrow Points of the Midcontinental and Eastern United States," Calf Creek, by Noel D. Justice, pp. 59 & 60. 1991, "Selected Preforms, Points, and Knives of the North American Indians," Andice, by Greg Perino, p. 4. 1991, "Selected Preforms, Points, and Knives of the North American Indians, Bell, by Greg Perino, p. 21.